Have your Pokemon Go team leader let you know which Pokemon has the goods! Another day, a new smattering of Pokemon Go news, right? This time the latest update to Pokemon Go comes with one important new feature: Pokemon Appraisal. It's a new concept that, according to the patch notes, lets players learn about specific Pokemon attacks. 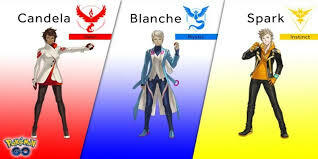 Players will learn from the specific Team Leader according to which team they chose to represent at the beginning of the game, whether it's Spark, Blanche or Candela to figure out which Pokemon are the best to be used in battle. Basically, they'll do the hard work for you to make sure you've got the best Pokemon for the job. There are several new features coming to the game still, as the developers attest, but there's not a whole lot in Pokemon Go to still worry about beyond catching Pokemon, heading into gyms and overtaking them, and generally just exploring to find new Poke Stops and other items. Hopefully it'll implement new and different features and options for players going forward, because there's only so much you can do with the same features over and over. The fact that developers are in fact addressing these criticisms, however is a good thing.